Every gardener knows that the secret to growing truly great plants is to provide a consistent environment. They also know that actually achieving a consistent growing environment is easier said than done. 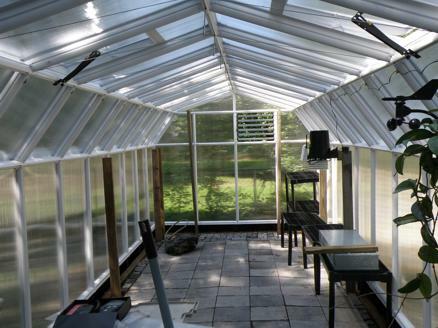 One of the best tools available for maintaining a proper environment is the greenhouse, which is an enclosed structure usually constructed from glass or polyethylene plastic. The most advanced greenhouses feature sophisticated climate controls that allow for complete control over cooling (venting) and heating. Thanks to the availability of mini greenhouses, it’s now possible for almost any homeowner to get in on the many advantages offered through greenhouse growing. When it comes to growing plants in a mini greenhouse there are certain things that need to be taken into consideration before success can become a reality. If there’s one mistake that I see greenhouse owners make time and time again it’s the assumption that plants can be placed inside and good things will automatically happen. It’s as if some gardeners view greenhouses as a way to avoid putting in effort. Unfortunately, it’s not quite that simple; in fact, growing plants in a greenhouse structure actually takes a certain set of skills that are different from those that are required for outdoor growing. In order to be successful growing plants in a greenhouse, it’s important to understand just how variable the internal environment can be if left unchecked. While greenhouses can certainly provide a level of consistency that’s impossible to achieve through traditional outdoor growing methods, achieving this consistency doesn’t happen automatically. Rather, the greenhouse owner needs to constantly monitor the environment either manually or automatically through a climate control system. The owner should become an active participant in the growing process, inspecting plants for insect and disease problems while ensuring that they are receiving proper soil fertility and moisture levels. For more information on how to successfully produce plants in the greenhouse environment, please head to your source on the web for all things greenhouse related at Your Mini Greenhouse.